Athlete. Born on May 2, 1975, in Leytonstone, Greater London, UK. A midfield player, he joined Manchester United in 1993, and the England team in 1996. He was a member of the 1998 World Cup team and the Euro 2000 squad, and was made captain in the lead-up to the 2002 World Cup. By June 2003 he had won 61 caps for his country. His many honors with United include the treble of FA Cup, Premier League Championship, and European Cup in the 1998-9 season, the first British side to achieve this feat. Beckham signed for Real Madrid at the start of the 2003-4 season. Amid much media interest, Beckham signed with the L.A. Galaxy in 2007 for a league high base salary of $5.5 million with additional funding coming in the way of endorsement deals, profit-sharing and marketing opportunities. 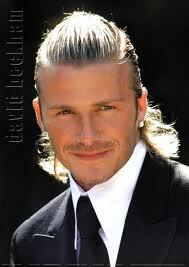 In 2001 he was voted BBC Sports Personality of the Year. He married Victoria Adams (“Posh Spice” from the pop group Spice Girls) in 1999. The couple has three boys, Brooklyn, Romeo and Cruz.